It may be tempting to lump this week’s “tiger summit” in St. Petersburg, Russia, in one’s mind with a global-warming convention or an Al Gore movie premiere. But the “tiger summit,” despite its slightly silly name, deserves better. The summit serves to highlight some deeply disturbing facts that will require dedicated action to reverse. To attempt to undertake such action, the tiger summit is seeking to raise $350 million to implement the first five years of the Global Tiger Recovery Program’s 12-year plan to try to double the tiger population in the wild. Okay, I know what some of you are thinking, but issues of conservation should not be the exclusive domain of the political left. “Conservative” and “conservation” come from the same root, and, whatever their high-minded ideals, it’s not generally the liberals who dedicate themselves to preserving, protecting, and nurturing that which is worthwhile in the world. Moreover, there is no bigger, more legitimate issue of conservation than the pending extinction—at least in the wild—of many of the earth’s greatest animals. With that in mind, we ought to talk a lot less about the “need” to reverse global warming or to stop sensible oil-drilling in the vast open expanses of Alaska, and a lot more about a key way in which our actions—or our collective inaction—truly can change the natural world for the worse. All of this, of course, will require money. And the $350 million that the tiger summit hopes to raise is a lot of money. But it’s less than a day’s worth of Obamacare—literally. (Once up and running—if not repealed—Obamacare would cost more than $500 million a day.) Even without the compulsion of the taxman, $350 million seems an attainable goal. That’s only about $1 for every American, never mind contributions from the rest of the world. Leonardo DiCaprio, who attended the tiger summit, made news this week by donating $1 million to the World Wildlife Fund to help conserve tigers’ habitats. Again, this might prompt mocking in some quarters, as actors and actresses are easy to lampoon—and often justly. But why not think of it instead as a wonderful example of a private citizen (and a tremendous actor, to boot) exercising his natural right to control his own property and to use it in the service of good. There are a lot of other things that DiCaprio could have done with that million dollars, but I, for one, am glad he chose this. The powerful tiger has to be on—and may well head—the short list of the most gorgeous and splendid animals in all of creation. And yet many of the greatest of animals, the tiger and the great apes chief among them, are in very serious jeopardy of essentially disappearing from the wild. The AP reports that tiger populations have declined by over 40 percent in the past decade alone, and three of the nine tiger subspecies (the Bali, Javan, and Caspian) have all become extinct—and not just in the wild—since around the start of World War II. One might be motivated by the biblical teaching that the creation of the animals was “good” and by our attendant responsibility to exercise “dominion” over them in a way that isn’t tyrannical but is just, or by the notion that a world in which a tiger can only be found in a zoo is an impoverished and imbalanced place. Or perhaps one’s motivation is simply a general sense of duty to protect incarnations of greatness, grandeur, and beauty in our world. Regardless, there are plenty of reasons to take action. I encourage you to do so. 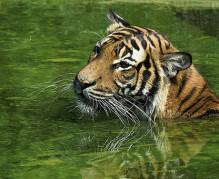 The tiger is well worth saving. This article originally appeared on PJ Media. Whether trophy hunting helps or hurts conservation efforts depends upon the specific circumstances of the animals and societies involved.